The webteam here at Prinston Media have designed a brand new website for selling/purchasing emergency apparatus. USAFireTrucks.com was officially launched on December 1, 2009. The site is a collaboration of three fire service news professionals: Rhett Fleitz (VAFireNews.com), Jeff Harkey (FireNews.net) and Grant Mishoe (SCFireWire.com). Each of these individuals has advertised fire equipment regionally on their respective sites for the last few years. After numerous requests for a similar service serving a wider area, the idea of USAFireTrucks.com was born. The site already boasts an impressive inventory from departments in various locations. Units are logically ordered for quick reference and an immediate point of contact is provided for each listing. Fire apparatus manufacturers have also begun to realize the potential of the site by listing their new stock and slightly used demonstrator units. Fire apparatus brokers are also listing equipment on the site. Small fire equipment is also being featured. USAFireTrucks.com possesses no inventory, and does not work as a broker: we are simply advertising equipment for sale through our extensive network and focused advertising. The process of listing a truck has been streamlined with our on-line submission form. We have developed a special pricing model to allow manufactures and brokers to continually feature high value equipment to the largest possible audience. Visit USAFireTrucks.com today to see the current inventory. USAFT can be reached at team@usafiretrucks.com or 888-620-FIRE. 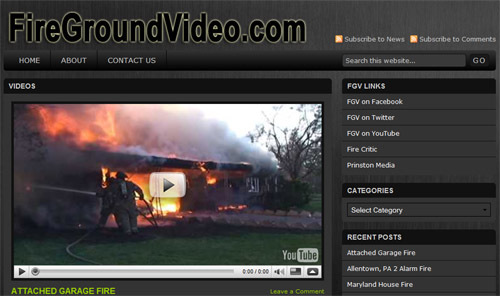 In an effort to keep FireGroundVideo.com growing and moving forward we have finished the rebuild of the site. We realize that the site is still very new, but we needed a new interface to bring videos to you effortlessly. After all, we don’t have a huge team of developers sitting back reviewing videos 24/7. What we do have is a better site for you and an easier interface for us to bring the content to you the reader. Please take a minute to check out FireGroundVideo.com version 2.o.